If you have been following our posts over on our Facebook Page, you would have seen us talking about something we have decided to call #govember. So we thought we had better just drop by and explain it in a little more detail. With just 2 months remaining in the year, time is flying by and before you know it, a new year will be knocking on the door. Whether you’ve achieved all you set out to do at the start of the year or if life got in the way during the year, there is still time. For some this brings excitement but for many, stress levels rise and depression kicks in as seasons change and pressure rises. Did you know that on average, 12 men each day take their life by suicide in the UK. If Three-quarters of all suicides in the UK are by men, that means (on average) 16 people take their own lives each and every day – a truly shocking statistic. In fact, a recent documentary on BBC with Professor Green brought home the harsh reality of suicide and the impact that it has on families and friends. To cut a long story short, this is something that is particularly close to our hearts at D-Toxd and had it not been for “failing” to become a statistic, D-Toxd wouldn’t be here today. That’s WHY we want to make a difference. We know what it feels like to be at that place where you think you have no other option. We know what it feels like to be at that place where a smile covers up so much pain and agony. We know what it feels like because we’ve been there – and not just once either. But we also know how it feels to come back out of it again – it isn’t easy but it can be done. We know how hard it is to rebuild everything. And we know that maybe now is the time we started to be more open about our journey back from the dark corners of reality. If we can speak out (openly and honestly) about our experiences, past and present, then maybe, just maybe, we give hope (and a voice) to those who feel that they can’t say anything. #govember is about doing the little things that matter. 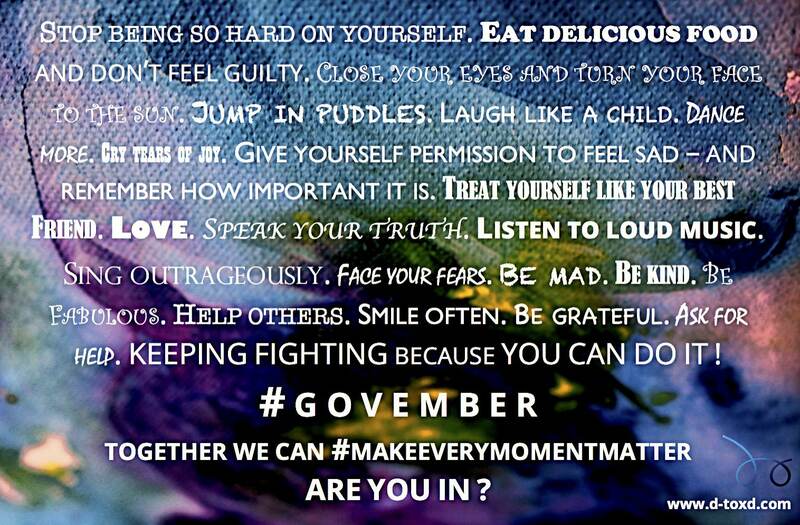 #govember is about how you #makeeverymomentmatter. We can’t do it alone and that’s why we need YOUR help because TOGETHER WE CAN. We can bring light into those dark places. We can reach out and touch other people’s lives in little ways. We can break the stigma that many people face around mental health. What if that extra smile you showed today gave someone hope? What if the bags you carried for someone showed them somebody cared? What if the message you sent arrived at the perfect time? What if the words on the postcard you wrote were smudged by the tears of happiness of the person who received it? What if that phone call showed them that someone was thinking of them? What if the song you danced to when you thought nobody was watching made them laugh a little bit? What if the compliment you paid or the sentiment you passed gave someone the strength to carry on? What if that genuine “are you doing OK?” have someone the opening to reach out for help? And yes, we know there is MoVember but not everyone can grow a moustache! #govember is for EVERYONE to get involved and make a difference. SO ! HOW DO I GET INVOLVED you might be asking ? All you need to do is share the message and do the little things that make a difference and #makeeverymomentmatter. Come on over to our Facebook Page and follow us there. Each day, we’ll be posting simple things that you can do. Simple things that raise awareness. Simple things that show you care. Simple things that make the world a happier place. You can also SHARE THIS BLOG as many times as possible – the more people that know, the better. We know that there are amazing charities out there who work tirelessly to change things, but this is what we have chosen to do and how we want to make a difference too.